1. 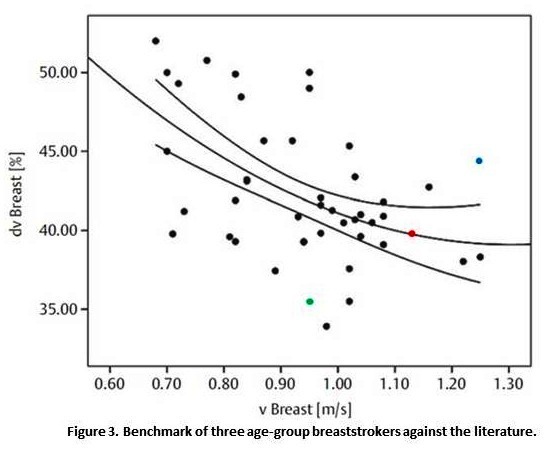 In this piece, we did the analysis of three age-group breaststrokers. 2. Modeled data sometimes does not fit completely the individual data of a specific swimmer. 3. After benchmarking the swimmers against data retrieved from the literature we have learned that one of the swimmers is able to reach a high speed (strong point), but with a high-speed fluctuation (main concern). 4. Several analyses were carried out to run a full diagnosis, prescribe what to change and predict the outcome of such improvements. He would be able to increase the speed by 0.1 m/s (faster) and decrease the speed fluctuation by 10% (more efficient). In my latest piece eventually, I shared a picture that depicts modeled and real data. At that time, it was explained that most textbooks and even research papers share modeled data because (i) it will be easier to understand a concept having “smoothed” data and; (ii) the modeled curve aims to represent the main trend across all subjects assessed. Unfortunately, there is a huge drawback of this. Most of the times the theoretical model does not fit the data of one particular subject. In academia, this falls under the topic “universal versus individual data analysis” (Barbosa et al., 2010). I.e., data from a pooled sample of swimmers do not represent what is the best for my swimmer. Indeed, the inter-individual variability is a concern for several researchers (Seifert et al., 2011). A very good example is the assessment of the speed fluctuation. The academic jargon for speed fluctuation is “intra-cyclic variation of the velocity”. Meaning, it is how speed changes over one single stroke cycle. As you are aware the swim speed is the result of the balance between thrust (propulsion) and resistance (drag). So, over one single stroke cycle, the speed goes up whenever the thrust is higher than the resistance. The speed goes down if the thrust is lower than the resistance. Let’s apply these two concepts (universal v. individual analysis; assessment of the speed fluctuation) to breaststroke. Figure 1 (top panel) depicts what would be the typical speed fluctuation at breaststroke reported in a textbook. At the begging of the stroke cycle, the speed goes up due to the kicking and eventually reaches a first peak (thrust by the kick is higher than the water resistance). After the kick, the swimmer will glide in the streamlined position. Because there is no thrust, only passive drag is acting upon the body, the speed decreases and we can find that “valley”. After the glide, it is performed the arms’ stroke and the speed increases once again (second peak). With the legs’ recovery, the resistance increases significantly and speed goes south sharply. 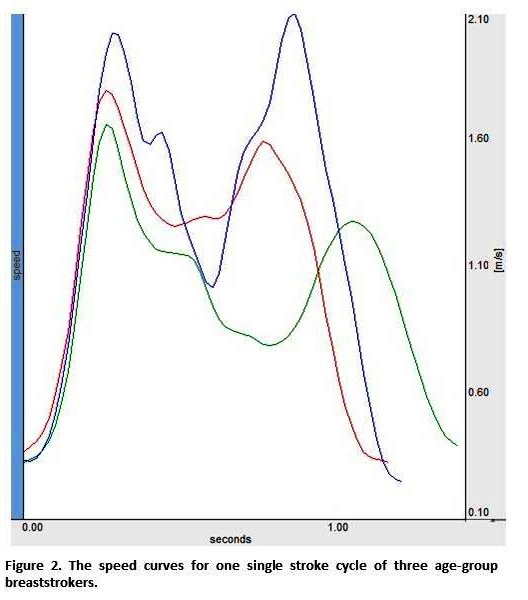 Now, that we did the recap of the stroke cycle at breaststroke, I must share with you that this curve is the modeled data of three age-group breaststrokers. 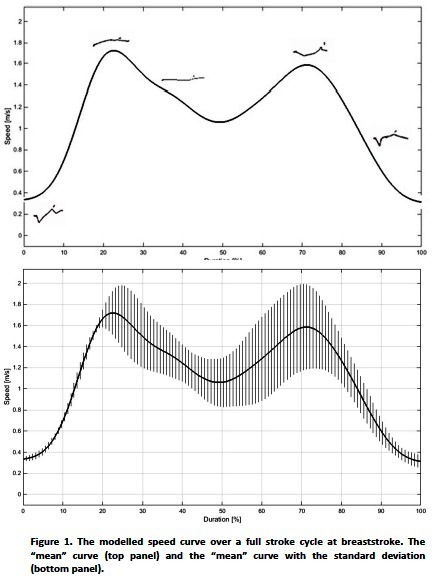 Figure 1 (bottom panel) depicts the variations in the modeled curve considering the individual differences among the three swimmers. For instance, at the beginning of the stroke cycle (the first upward slope, i.e., kicking) the vertical lines are rather small. That means that the three swimmers are quite similar, little difference can be found among them. But, the vertical lines on the second peak are big. So, it seems that the three are doing a thing in a different way at this phase of the stroke cycle. So far, we did the analysis of the pooled and modeled data of three swimmers (i.e. universal analysis). Moving on to the individual analysis. Figure 2 depicts the individual curves of each subject. One seems to be a top-tier age-group breaststroker (blue line), the other two a mid- and low-tier swimmers (red and green lines, respectively). Now, you understand why I told you at the beginning that unfortunately the modeled curves most of the times do not fit the individual curves. Figure 1 was computed based on the data of these three swimmers represented in Figure 2. We can see that at the beginning the curves of the three-match almost perfectly, but then start to drift away from each other. This is why the variation is low at the beginning of the cycle and high at the end as shared earlier (vertical lines, i.e. standard deviation, in figure 1 – bottom panel). Now, we are ready to do the quantitative analysis. For the kinematic analysis, I selected the average swimming velocity (v), stroke frequency (SF), stroke length (SL), maximal velocity (v-max) and minimal velocity (v-min) within the stroke cycle. Two other variables were selected as efficiency estimators, and this includes the stroke index (Costill et al., 1985) and the speed fluctuation (e.g., Barbosa et al., 2005). Based on the average speed over the cycle it is easy to follow that we are assessing swimmers of different competitive levels. The green swimmer has a lower speed, SF, SL, DV, and v-max. What makes the difference between the blue and red swimmers? The SF is slightly higher, but the SL shorter for the later breaststroker. The red swimmer has a lower speed fluctuation than the blue counterpart. So, this deserves some further investigation. First things first, we should benchmark the swimmers against other subjects in our database or data retrieved from the literature. Today I will benchmark the swimmer against the data reported in a research paper (Barbosa et al., 2013). The black dots are the data reported in the paper, the colored dots are our swimmers. We are benchmarking the relationship between speed fluctuation and swim velocity. Now, we are sure that the green swimmer is an average breaststroker, the red a mid-tier-almost-top-tier, and the blue a top-performer. 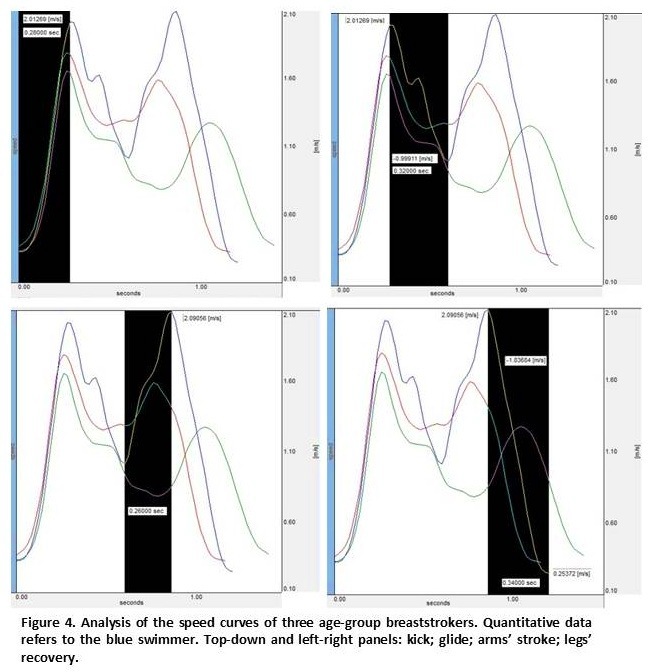 The main concern is that the blue swimmer despite reaching a high speed also shows a big speed fluctuation in comparison with two other counterparts that race at similar paces (1.2-1.3 m/s, black dots). These two reach the same speed with speed fluctuations lower than 40% though. Being the bigger picture, now we should do the analysis of the individual curve of the blue swimmer. The top-left panel (figure 4) depicts the kick. The blue swimmer is the one reaching the highest speed (2.01m/s). The rate of speed development is the same for the three, but the kicking action is 0.03s longer for the blue swimmer (the kick took 0.28s). So, one might say that the kick power (or mechanical impulse) is quite nice for the three, the main difference might be in the legs’ sweep. This is the end of the kick when the swimmer squeezes up the water between the calf and feet, the plantar surface almost touches each other and toes point backward-inwards. The top-right panel (figure 4) is related to the glide. This seems to be a major drawback for the blue swimmer. The speed drops 0.99m/s in 0.32s. Probably the glide is a little bit too long and the body position, not the best. For instance, the red swimmer does not have such a significant decrease in speed. One should have arms fully extended and horizontal, head in a neutral position between the upper-arms and looking downward-forward, hips high close to the surface, legs fully extended and horizontal with no sinking of the feet. The bottom-left panel (figure 4) reports the arms’ action. That took 0.26s and he reached a maximal speed of 2.09m/s. The blue swimmer is very balanced because the ratio between the maximal speed reached by kick and arms is 2.01 v. 2.09m/s. 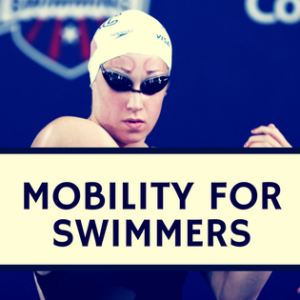 Several breaststrokers are more kick-driven and neglect the arms’ stroke. Both the red and green swimmers are not able to reach the same speed over the arms’ stroke they did at the kicking. I.e., the second peak (arms) is smaller than the first (kick). If they improve the arms’ action, the average speed would increase even though at the cost of the efficiency (i.e. probably speed fluctuation would increase). With that, they would reach the performance level of the blue swimmer. After reaching such level would be time to think about the speed fluctuation (which is what we are doing right now to the blue swimmer). The bottom-right panel (figure 4) help us to have a deeper understanding of the legs’ recovery when the knees and hips bend. This should be another concern for the blue swimmer. In 0.34s he loses 1.83m/s reaching the lowest speed (0.25m/s). I.e., for tenths of a second he almost stopped in the water. Avoid dropping the thighs. Less bend by the hip and keep the knees high. The end of the arms’ sweep and legs’ recovery happens at the same time. Head moves as one with the torso (spine completely aligned). Do not bend or extend the neck. This phase is all about tempo and sync between upper and lower limbs. How much will be the improvement? Well, the diagnosis is done. 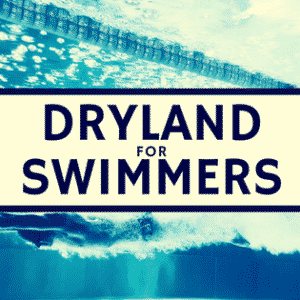 So we can try to help the blue swimmer to be one of the finest breaststrokers. Time to recap what we’ve learned so far: his propulsion is very good. Let’s keep this good work. The resistance after the glide and legs’ recovery are two concerns and deserve special attention. Good coaches will suggest a set of drills in order to improve the gliding position, the tempo (notably the duration of the glide), the thigh and shank positions over the legs’ recovery and timing between arms and legs. Follow the link for a comprehensive list of drills (WARNING: the original paper is in Portuguese. Sorry for the inconvenience. If you speak a Latin language it is easy to understand. Alternatively, I have a nerdy solution for you: 1. Install the “google translate” on your smartphone or tablet; 2. Set the app to translate from Portuguese to English; 3. Below the field to type the word to be translated you will find the camera icon. Press that icon/button. 4. Point the camera to the text and the app will automatically translate the text for you. 5. To clarify: you need a hardcopy of the piece or softcopy being displayed on a second device. E.g., display the piece on a laptop and use the phone for the automatic and real-time translation). A good analyst will try to predict what happens with the changes advised. He will have to work the math, do some modeling, signal processing, chunk the numbers and provide a result. My prediction for the blue swimmer is as follows. If over the legs’ recovery the speed does not decrease up to 0.25m/s but 0.33m/s, the speed fluctuation improves to 36.03% and the speed to 1.36m/s (i.e. 0.1m/s faster). 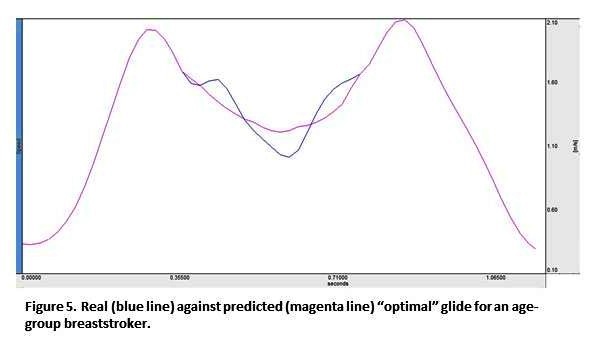 Figure 5 includes the real glide (blue line) and the “optimal” glide (magenta line). 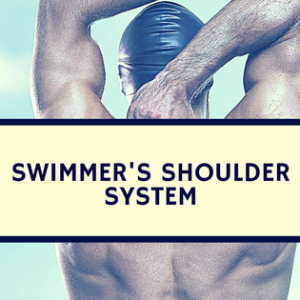 If the swimmer improves his glide, the speed fluctuation reduces to 35.29% and the speed to the same 1.36m/s. So, if the swimmer and the coach embark in only one of these two solutions, the dv-v will be 35%-1.36m/s. End of the day, shifting the blue dot in figure 3 to the coordinates (35; 1.36) one can learn that the swimmer not only becomes the fastest but also the most efficient. 1. Barbosa TM, Keskinen KL, Fernandes RJ, Colaço C, Lima AB, Vilas-Boas JP. (2005). Energy cost and intra-cyclic variations of the velocity of the centre of mass in butterfly stroke. Eur J Appl Physiol. 93: 519-523.